Thanks to two allocations of Director’s Discretionary Time and a successful Fast-Turnaround program, an international team (including Gemini Emeritus Astronomer Tom Geballe, who wrote this summary on behalf of the team) used Gemini North/GNIRS to follow the evolution of the near-infrared spectrum of the core-collapse supernova 2017eaw (ccSN 2017eaw) over three semesters. The data obtained from this relatively nearby event may help us to better understand the existence of dusty galaxies in the early, much more distant Universe. One of the unexpected discoveries in studies of the very early Universe is that many high redshift galaxies are “dusty.” These dusty galaxies exist as recently as several hundred million to a billion years after the Big Bang. The origin of this dust is somewhat of a mystery, because stars with masses similar to the Sun, which constitute the vast majority of stars in a galaxy, would not have evolved to the dust-producing stage in such a short time. Thus, there must be another source of dust in these very distant and very young galaxies. Where Does Interstellar Dust Originate? Interstellar dust constitutes about 1% of the mass of interstellar matter in our Milky Way and in many other galaxies. It is generally understood that the origin of most of that dust is stars with masses roughly similar to that of our Sun, that became red giants and ejected their outer layers into space. Although initially almost entirely hydrogen and helium, during the red giant phase the outer layers of those stars are polluted by heavier elements such as carbon, nitrogen, oxygen, silicon, magnesium, and many others that are produced by thermonuclear reactions deep inside the stars and then mixed into the outer layers. Once the ejecta cool to temperatures lower than about 2,000 K, dust particles inevitably start to form out of these heavy elements. However, it is billions of years after these stars formed when this happens. On the other hand, core collapse supernovae live only a few millions to a few tens of millions of years before they explode, during which time they turn most of their hydrogen-rich and helium-rich interiors into vast reservoirs of heavy elements. Thus, unlike stars like the Sun, massive stars are potential dust-producers in the early Universe. One possible source is the ejecta from massive stars that explode after only a few millions to a few tens of millions of years after they form, the so-called core-collapse supernovae (ccSNe). Figure 1. 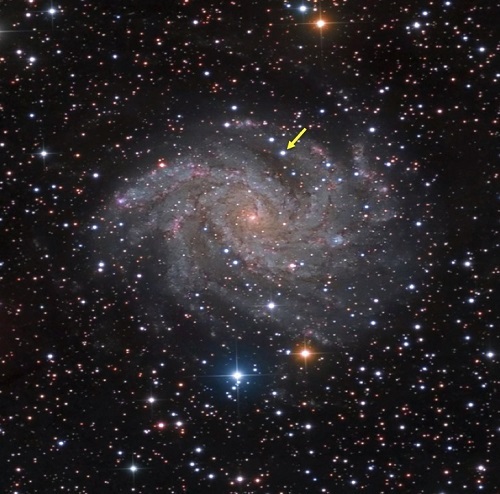 Image of spiral galaxy NGC 6946 and SN 2017eaw indicated by arrow. Photo courtesy of Damian Peach, obtained on May 28th, 2017, at 10:31 UTC from the Sierra Remote Observatory, California. The Great Basin is the largest area of contiguous endorheic watersheds in North America. It spans nearly all of Nevada, much of Oregon and Utah, and portions of California, Idaho, and Wyoming. While we cannot study individual supernovae in such distant galaxies, we can find examples of them in the nearby Universe. Infrared- and millimeter-wave observations of several “local” examples have revealed that ccSNe can produce copious amounts of dust — up to one solar mass for each event. Until now, however, detailed evolution of dust production in such supernovae, which can take place over several years, has only been followed in one object: the very nearby, famous, and rather unusual ccSN 1987A in the Large Magellanic Cloud. Fortuitously, our recent observations of ccSN 2017eaw in the nearby galaxy NGC 6946 provided another rare opportunity to follow that evolution in detail over an extended period. NGC 6946 is located about 7 megaparsecs away and is popularly known as the Fireworks Galaxy, because it is a prodigious supplier of supernovae (see Figure 1 and a pre-SN 2017eaw Gemini Legacy Image of NGC 6946). SN 2017eaw was discovered on May 14, 2017, just as its host galaxy, NGC 6946, became observable in the eastern sky before dawn. Because of its high northerly location, we saw an opportunity to follow SN 2017eaw continuously from May until December (before it became too low in the western sky to observe from Maunakea) and proposed the idea to Gemini Observatory. Thanks to two allocations of Director’s Discretionary Time and a successful Fast-Turnaround program, the team led by Jeonghee Rho (SETI Institute) was able to follow the evolution of the supernova’s near-infrared (0.84-2.52 micron) spectrum in Semesters 2017A, 2017B, and 2018A. The team also includes Tom Geballe (Gemini Observatory), Dipankar Banerjee and Vishal Joshi (Physical Research Laboratory, Ahmedabad, India), Nye Evans (Keele University, U.K.), and Luc Dessart (Universidad de Chile). During 2017-18, we obtained Gemini North/GNIRS (Gemini Near-InfraRed Spectrometer) data on ten dates between 22 and 387 days after the discovery. It is believed that these data represent the highest quality and most extensive near-infrared time-sequence of spectra ever obtained for a Type II-P SN, the most common type of ccSN, whose light curve has a distinctive flat stretch (called a plateau). The first nine of these spectra, obtained in 2017, are shown in Figure 2. While they are a goldmine of information — revealing details on elemental abundances, nucleosynthesis, changes in ionization, and velocities of the ejecta — our major goal was to witness and model the formation of the molecule carbon monoxide (CO) and dust, which is quite hot when it forms. Information on these species is contained only at the long wavelength end of the spectra, from 2.0 to 2.5 microns. CO is important because it is a powerful coolant of the ejecta, which aids in making dust formation possible. Its presence is clearly detected on day 124 by the sharp increase in signal near 2.30 microns, and we think it was already marginally present at day 107. The dust signature also begins at day 124, and is the flattening slope of the continuum from 2.1 microns to longer wavelengths, compared to the steadily decreasing continuum signal at shorter wavelengths, and across the entire spectrum at earlier times. We have used the spectra to estimate the CO mass produced by SN 2017eaw and find that it is qualitatively matched by models in the literature of a progenitor star of mass roughly 15 times that of the Sun. Fits to the continuum indicate that the temperature of the dust emitting at 2.1-2.5 microns is ~ 1,300 K and that the dust is mainly graphitic, which, unlike amorphous carbon, can condense at higher temperatures than this. Discussion of these and other results and analysis are reported in Rho et al., The Astrophysical Journal Letters, 864: L20, 2018. We are continuing our monitoring of SN 2017eaw in Semester 2018B; thereafter it will be too faint. In future semesters, we hope to measure additional nearby ccSNe that occur in order to estimate the frequency of CO and dust production by such SNe, as well as the masses of CO and dust produced by each.